Minimalist jewelry is everywhere. It’s in department stores; it’s on Instagram, it’s all over celebrities. Just when you think you’ve seen it all, you find new ways to layer, combine, and style these simple pieces. 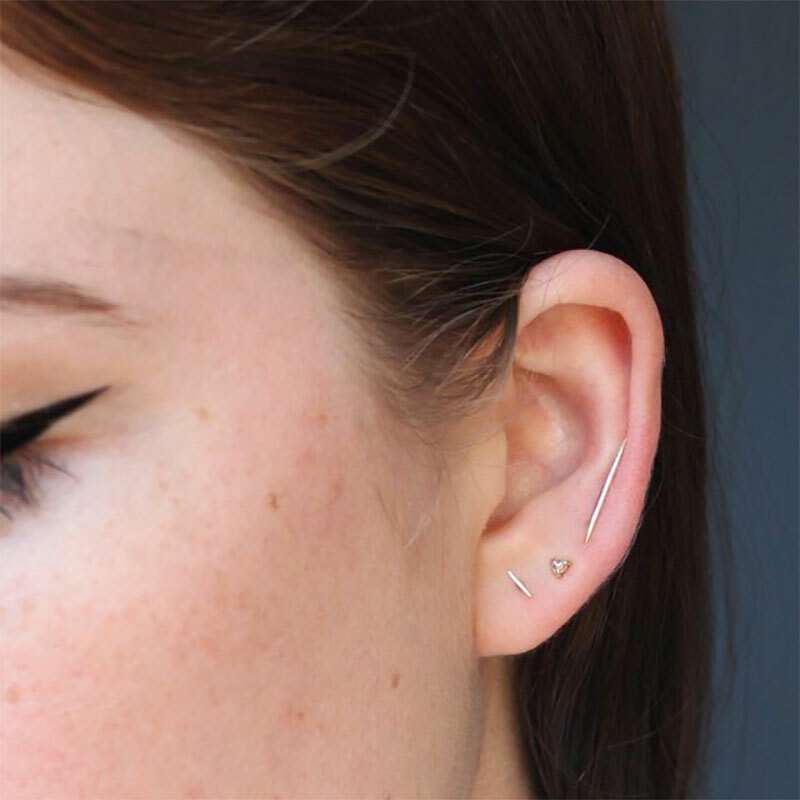 You might even consider getting your ears pierced again just so you can layer more minimal and trendy earrings. While we are all for statement jewelry, larger jewelry makes it difficult to wear multiple jewelry pieces at once. 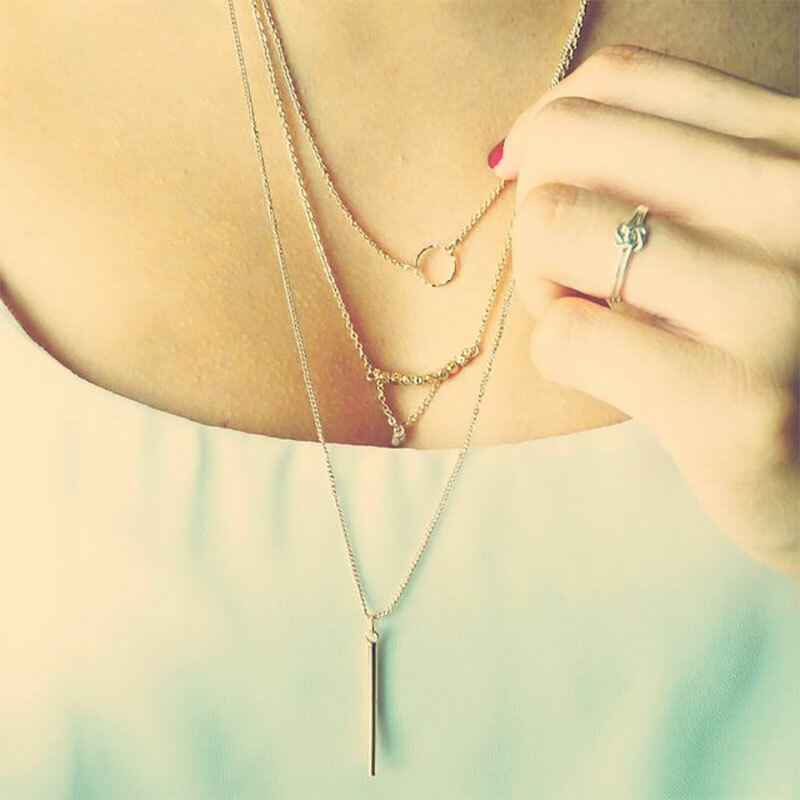 Layering minimal jewelry is effortless because each piece is so basic and so understated. If you stick to minimalist pieces, you may as well invest in fine jewelry because this trend isn’t going anywhere anytime soon. 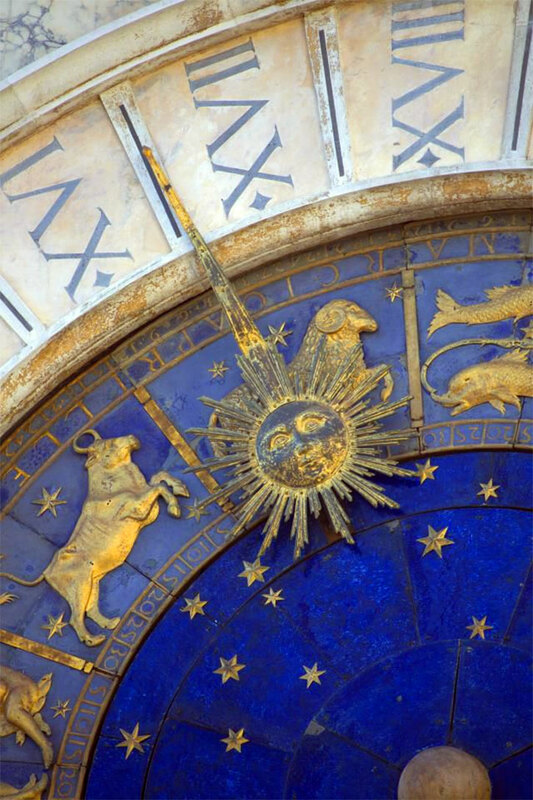 Gold and other precious metals will withstand the test of time much better than any base metal. However, designer jewelry can get expensive, fast. Even though minimal jewelry may contain only a small amount of gold, designer pieces could cost well over a thousand dollars. Your better bet is to find small, boutique jewelry brands that don’t have the same amount of overhead as some of the bigger names. We’ve sought out five of our favorite minimal jewelry brands that offer affordable fine jewelry. You can’t beat these prices! Catbird NYC is a popular boutique shop and brand that was founded in 2004 in Williamsburg. Catbird curates various jewelry on their site, but the brand also has their own line of minimal jewelry. Their jewelry is made in their NYC studio by their small but dedicated team with recycled or fair-trade gold and conflict-free stones. The shop has a large selection of solid gold minimal pieces for unbeatable prices. 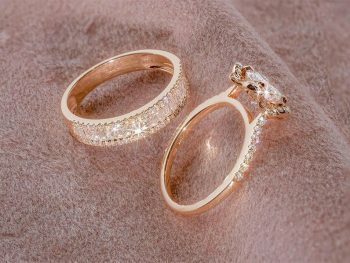 Our favorites are the Mignon Memory Ring that comes in solid 14k rose gold for under $50 and the Big Secret Ear Climber in solid 14k yellow gold for under $100. Modern Citizen’s mission is to make luxury items accessible without compromising on quality. The California-based company offers stylish minimal jewelry using a mixture of gold and sterling silver. 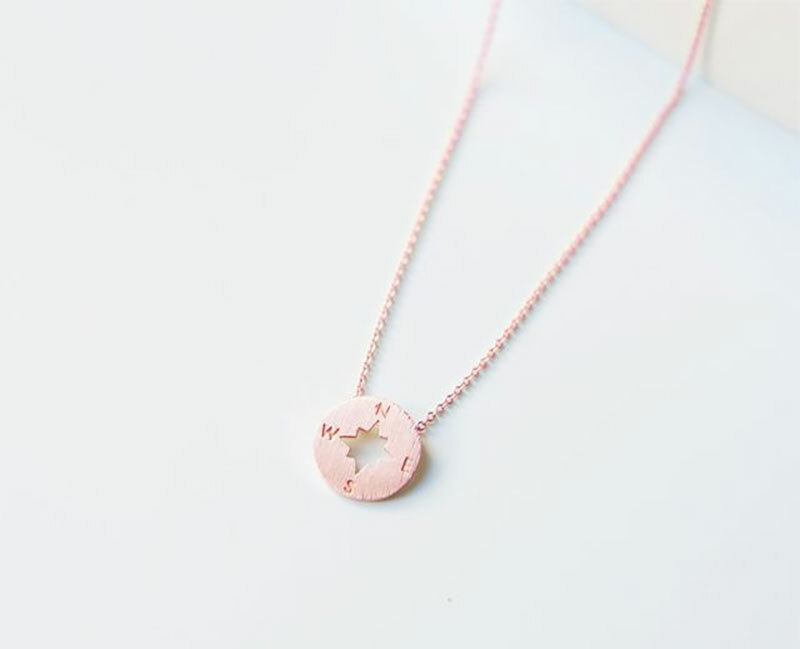 Their staple 14k rose gold Going Places Pendant Necklace sells for under $100. It is rose gold plated sterling silver that will last for decades with the proper care. 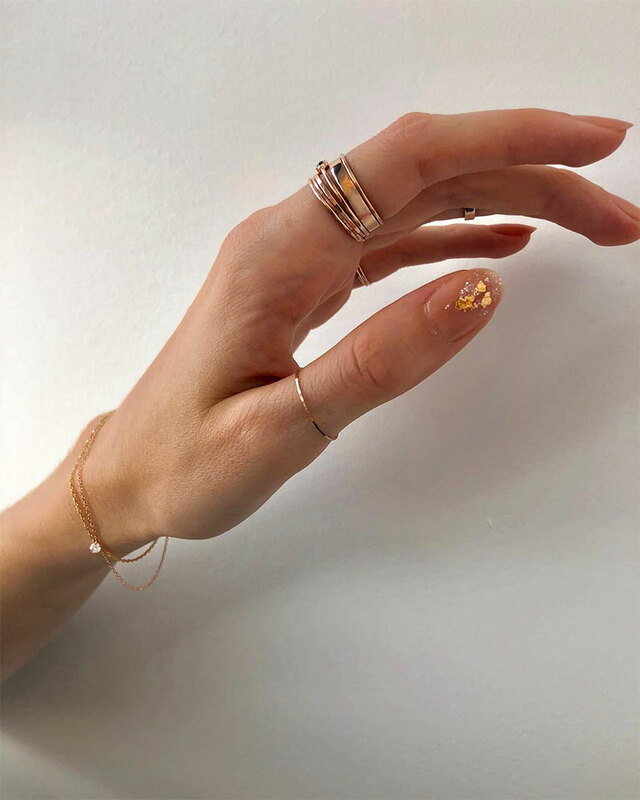 Tiny Om is a jewelry brand founded by Virginie Dreye. She combined her talent for graphic design and her love of yoga to bring this jewelry line to life. 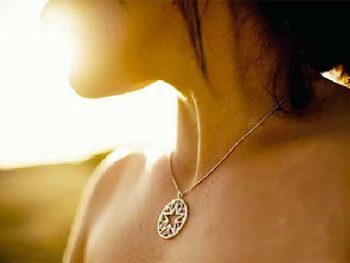 Just like pendants originated as the talisman with a purpose, so too does this jewelry act as a link between ourselves and the universe. Just because the jewelry is minimal, doesn’t mean it has to be without style or purpose. 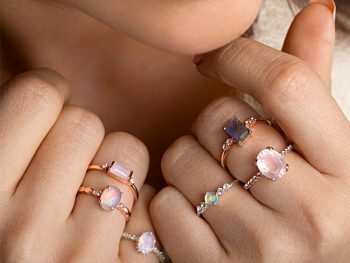 These Pure chakra rings from Tiny Om are made from solid 18k rose gold and diamonds. The pave set diamonds will set you back just over $500. AUrate is a jewelry brand founded by Sophie Kahn and Bouchra Ezzahraoui. 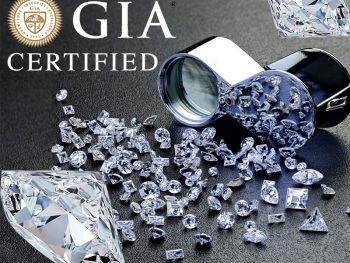 This company is determined to rewrite the rules in the fine jewelry industry. They work to offer quality products at an honest price, and this Gold bar necklace is no exception. For just under $500, you can own this solid gold bar necklace in either yellow or rose gold. All jewelry is handcrafted by the company’s jewelry artisans right in the heart of the NYC diamond district. Another admirable quality of this jewelry brand is the commitment to literacy. 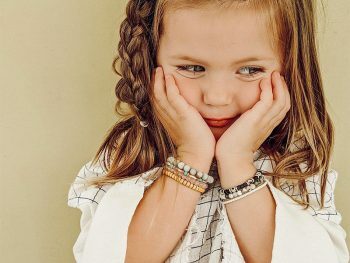 For every piece of jewelry they sell, they will give a book to a child in need. Louison Fine is a jewelry brand founded by Angela Louison. As a third generation New Yorker with a passion for jewelry, Angela is determined to offer contemporary jewelry with an heirloom quality. Each piece is handcrafted in NYC using recycled and repurposed materials. Each design is offered at a very limited quantity by some of the best jewelry artisans. 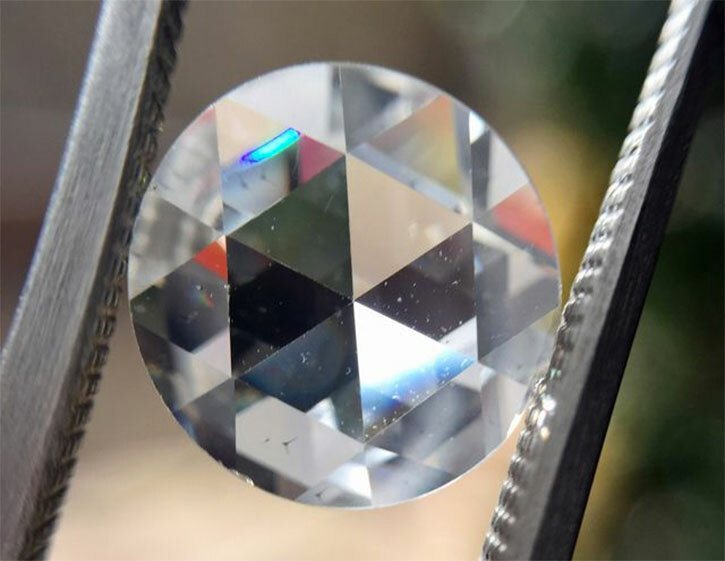 When you purchase from Louison Fine, your purchase works to support a small group of jewelers that are passionate about quality but won’t upcharge you for it. The Petite Safety Pin Earring collection is one of our favorites. 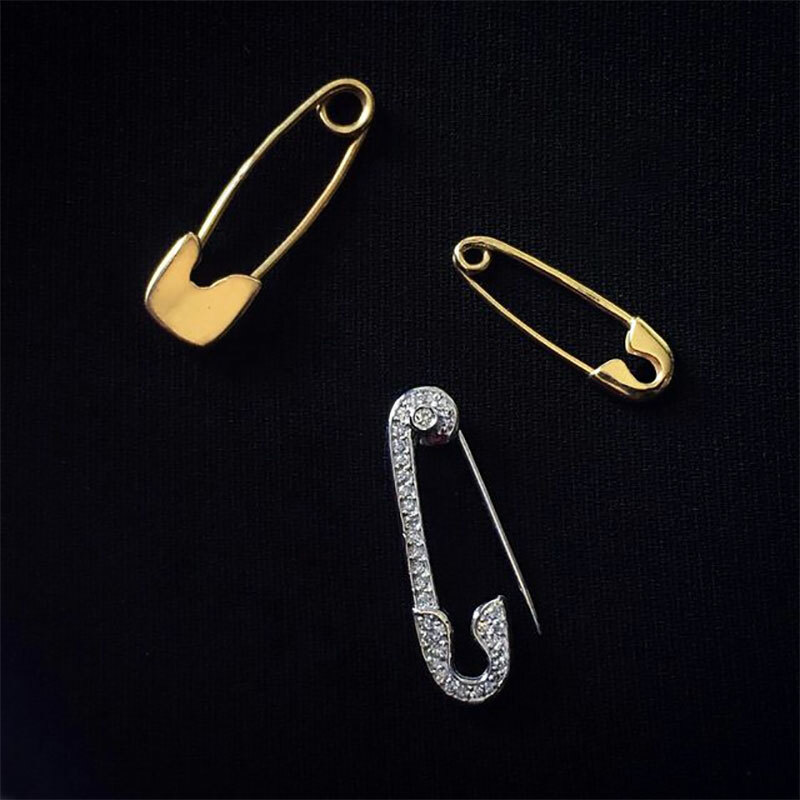 The smallest of the three pins are offered in 14k yellow gold for under $200. Louison Fine does a great job of combining minimalism with antique and vintage motifs. 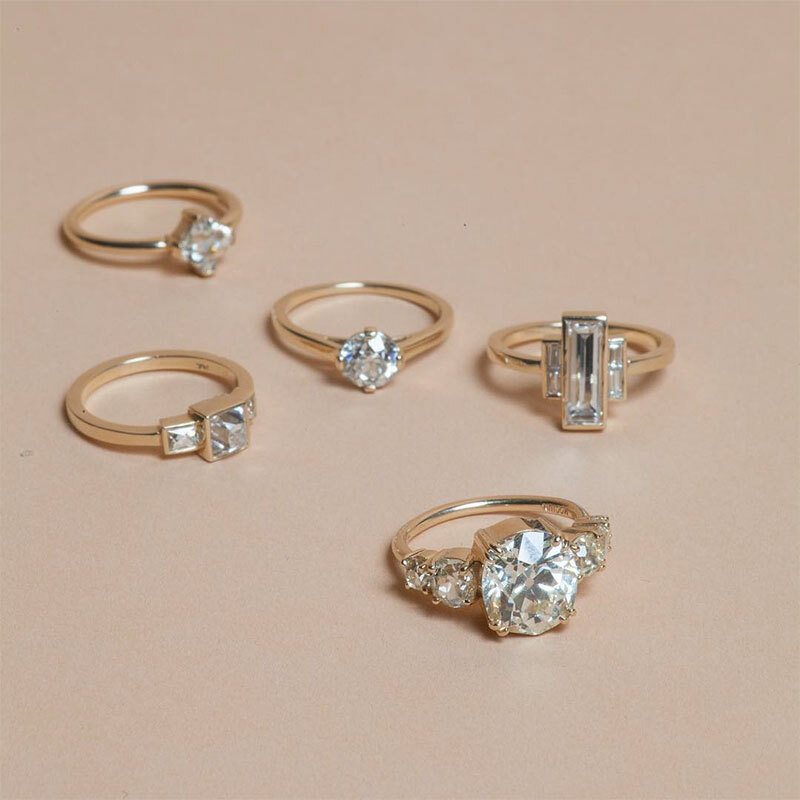 Stuck in a jewelry rut? If you are a fan of simple, refined accessories, follow these minimalist jewelry brands on Instagram. There’s no shame admitting how much time you spend scrolling through hundreds of stories on social media. 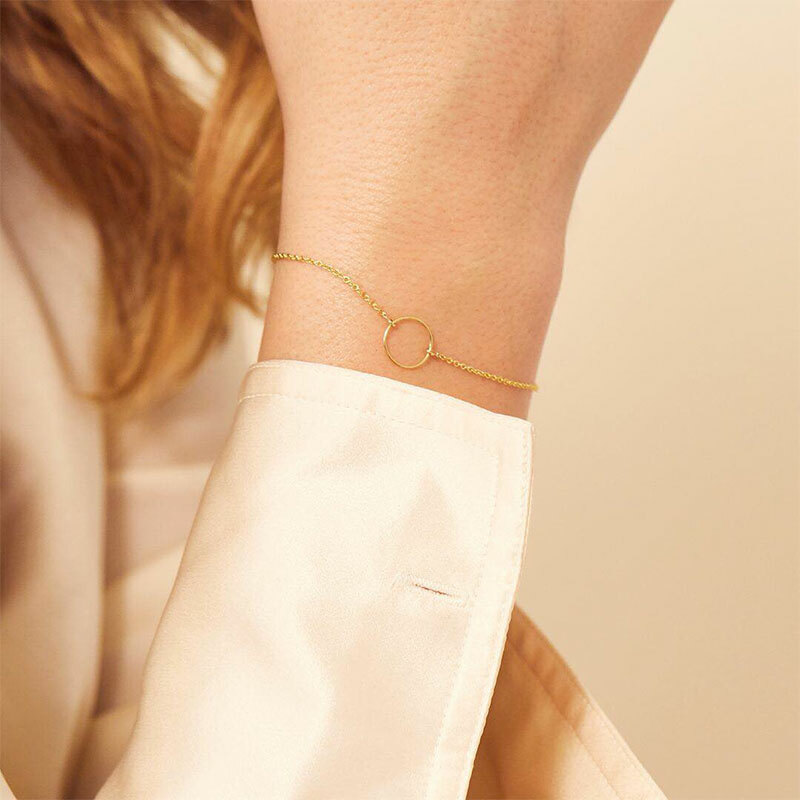 We in particular love perusing minimalist jewelry brands on Instagram for the latest dainty, perfectly layered baubles. We’re not alone. These jewelry accounts have taken the social media app by storm the past couple of years, increasing their followership dramatically. Why do these companies do better on Instagram than any other network? 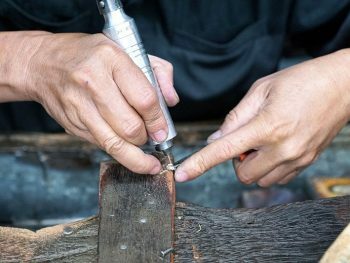 It’s because jewelry brands are pros at making their jewelry look irresistible and, in some way, perfectly attainable — even if it isn’t. 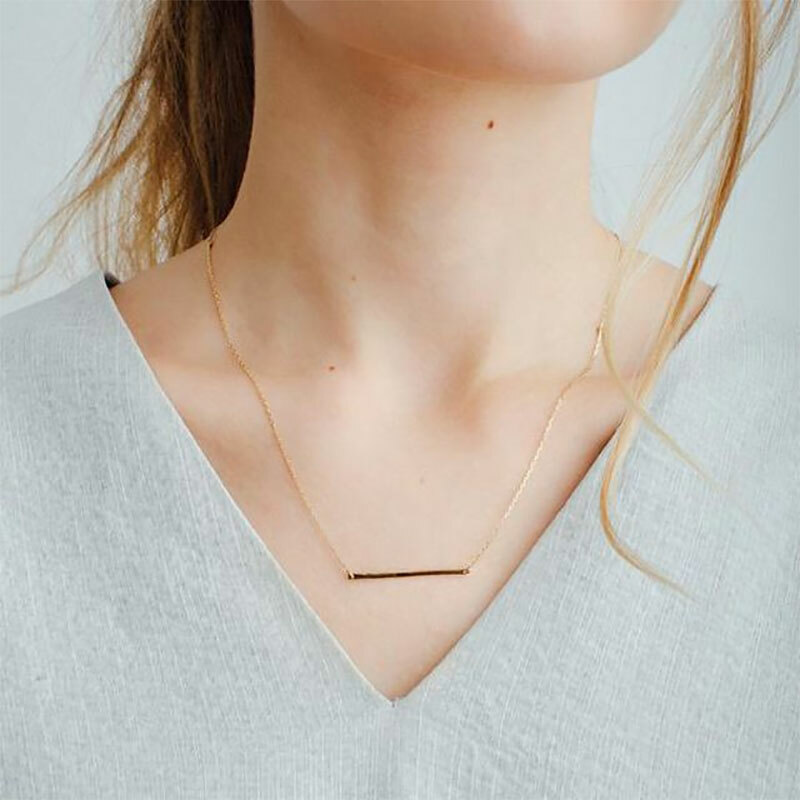 Check out our favorite minimalist jewelry brands on Instagram that are flooding our feed with ideas and inspiration we can actually wear and afford. 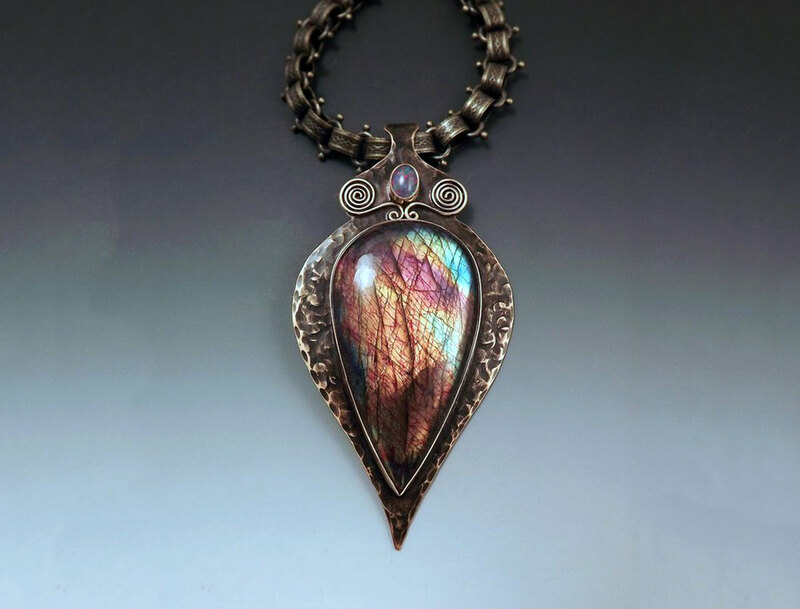 Coined as “handmade heirlooms for the modern goddess,” @loganhollowelljewelry knows how to make jewelry look seductive and enticing. Almost every photo features a goddess-like model wearing multiple pieces of perfectly styled minimal jewelry. The feed is provocative, consistent, and inspires an enchanting sense of wanderlust that you can’t help but pair with some gold and diamonds. What piece should you invest in first? The designer is best known for her zodiac diamond ear climbers like the ones you see here. The elegance of @vraiandoro‘s feed is instantly eye-catching. There are black and white undertones throughout every image with pops of gemstone color here and there. The styling seems effortless and natural, despite it also being very modern and clean. 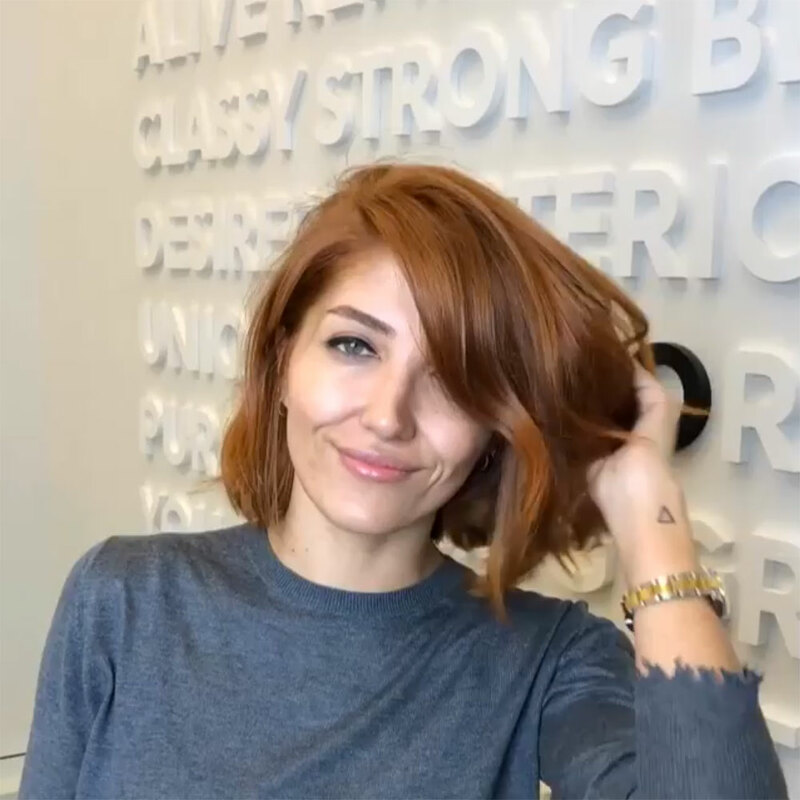 The consistency from one photo to the next makes this feed one to admire both for each photo and as a whole. 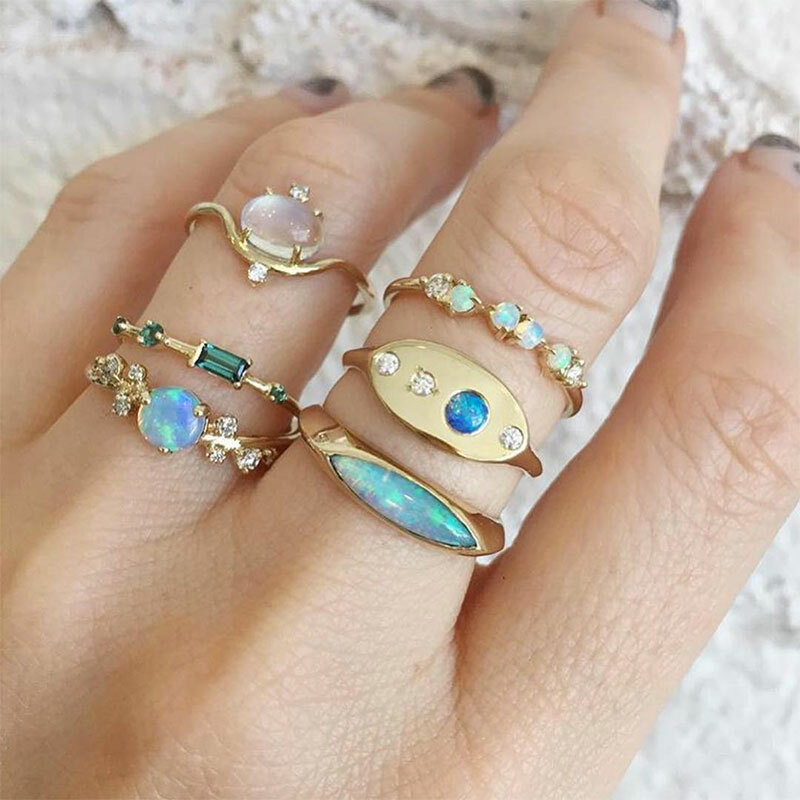 If you’re a fan of ring stacking, then you will be a fan of @valejewelry. 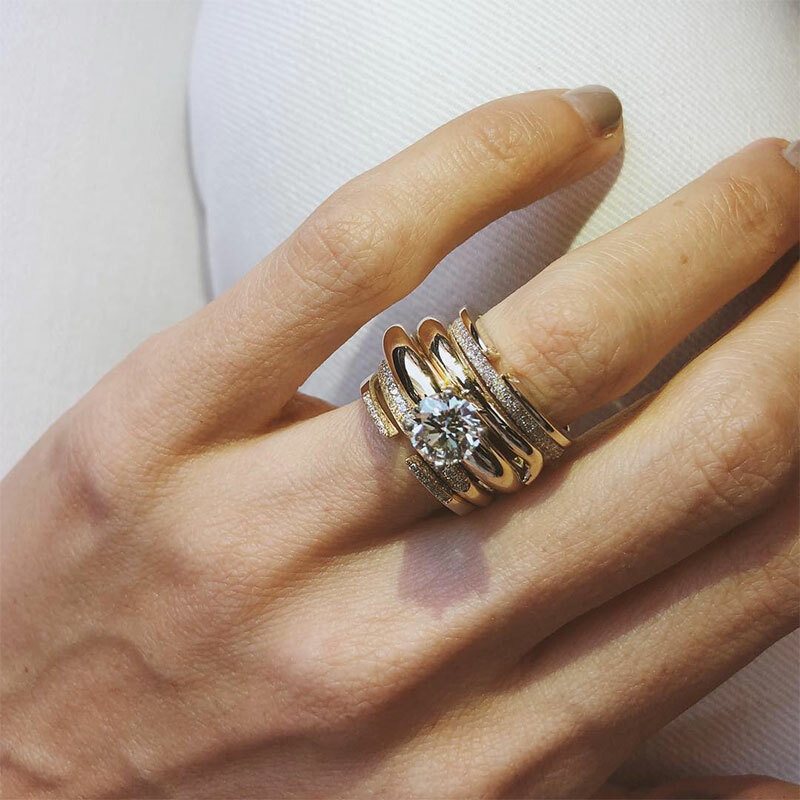 Not many jewelry designers out there can stack 12 diamond bands onto one finger and make it not only look incredibly beautiful but also completely wearable. Their designs stack so well together, and their Instagram feed is a testament to this. 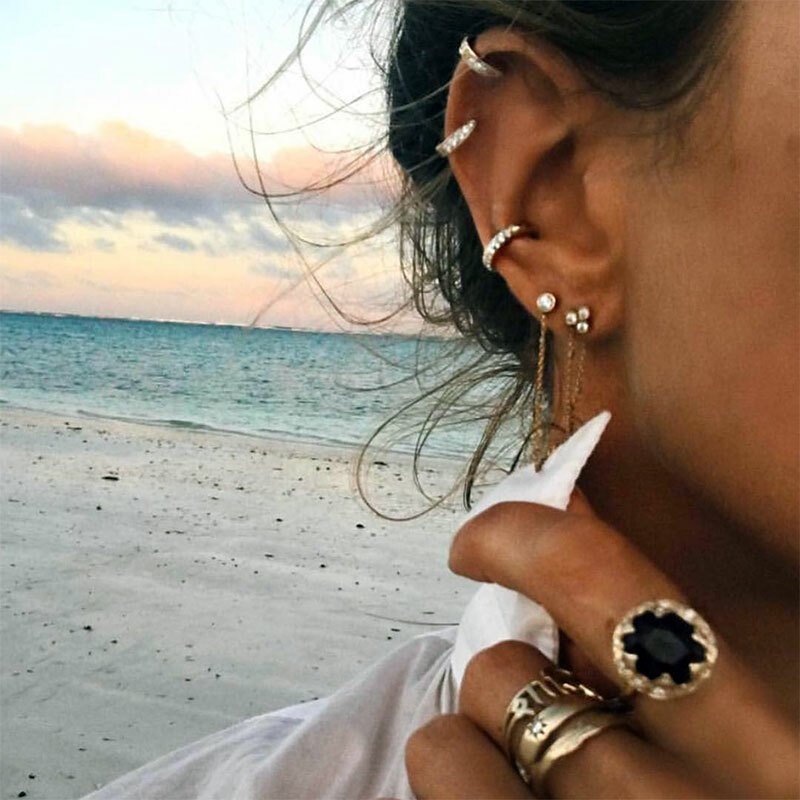 With over 1,000 posts, you could spend hours coming up with new minimalist jewelry inspiration, just when you thought you’d seen it all. 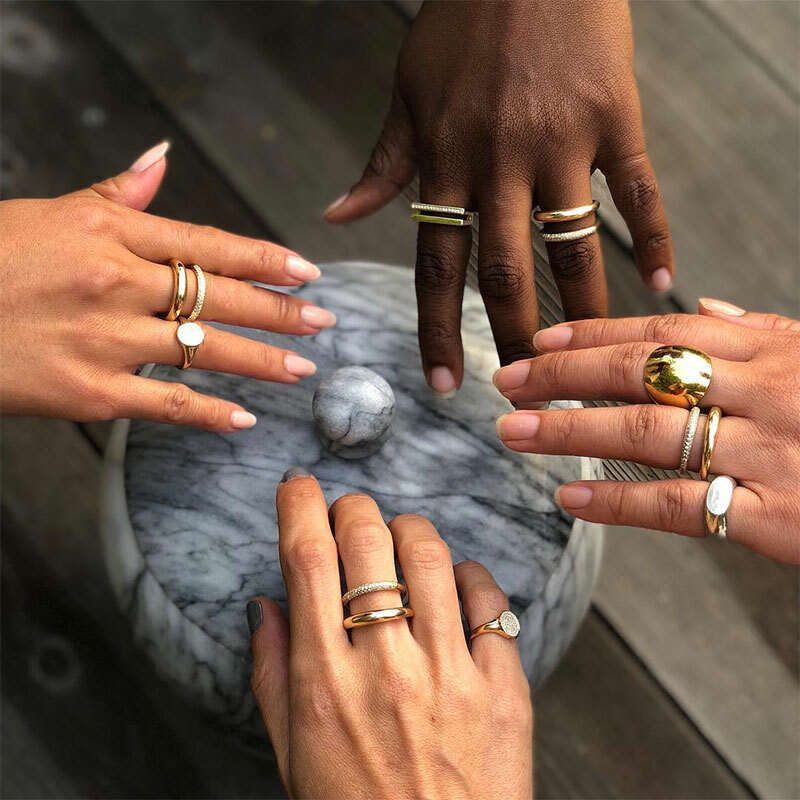 The team over at @catbirdnyc has created one of the largest communities of minimalist jewelry lovers with over 175K followers. Their feed doesn’t necessarily stick to one style or composition but instead bounces from various lighting types and scenes. With 4,500 pictures and counting, the jewelry is certainly the underlying theme which is very minimalist by definition. The opal-focused @wwake‘s Instagram feed is very structural, which is the best way we can think to describe it. Photographs of modern geometric shapes balance well with models that have minimal makeup and flawless skin. 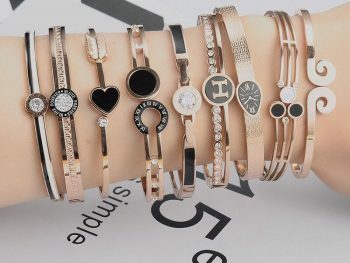 The most “liked” pictures are of well-positioned jewelry pieces on a white background because even though their jewelry is minimal, it makes a statement. If you love pottery and minimalist jewelry, then you will love the NYC-based @mociun. Their feed is very bright and refined, editing out a lot of the clutter. Rings are usually shot on the same hand, in the same position, with the same lighting, and in this case, it’s not a bad thing. Their feed is reminiscent of their storefront in Brooklyn which is very simple. 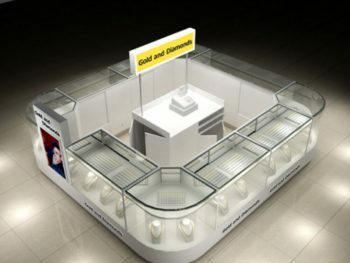 Their showcases might have ten rings in it tops, whereas most showcases display hundreds, if not thousands of rings in a case at a time. The set up is a nice respite, though, allowing the onlooker to admire the beauty and simplicity in the highly curated collection. Fan favorite @jacquieaiche‘s Instagram feed is inspirational in that not your everyday person can have a feed quite like this one. Instead of having a very personal, down to earth feel, this one is filled with gorgeous models and professional photography. 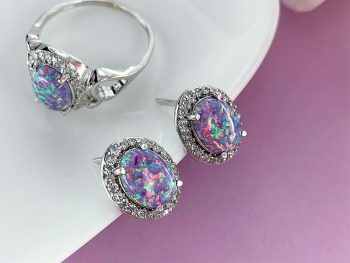 The jewelry is highlighted exceptionally well and styled to perfection. 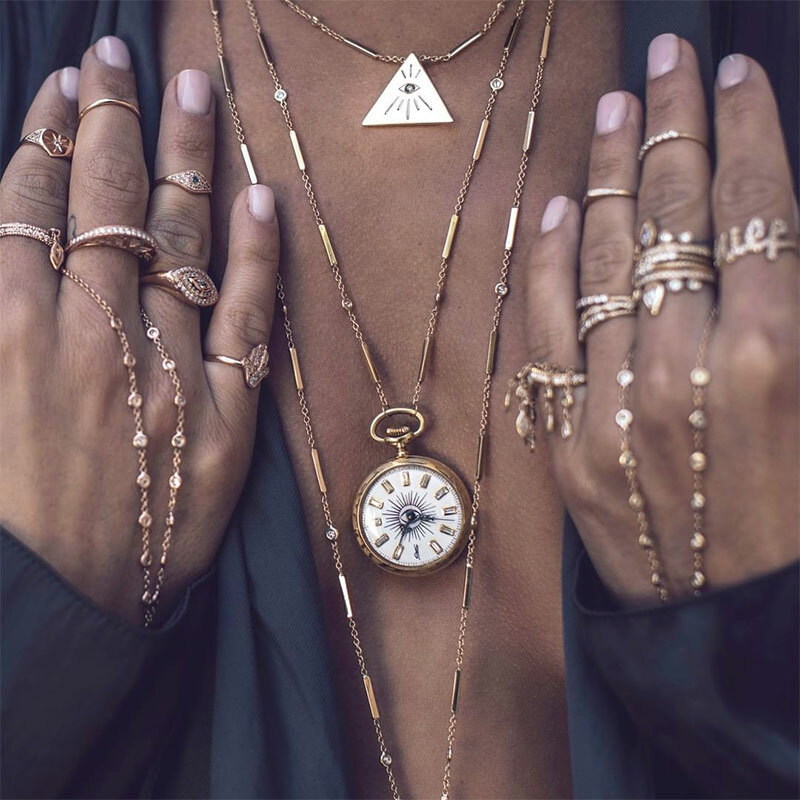 You’ll be able to collect numerous jewelry layering ideas from their collection and will be continually impressed with the editorial caliber of their shots. If you took a modern design and combined that with feminity that has a vintage flair, you would have @ladyartigas‘ Instagram feed. Soft lighting hazes into every photograph, from a picture of vegetables to a flawless street hand selfie. Though some minimalist style can come across very edgy and masculine, the designs from Gabriela Artigas are always styled in a feminine way, whether through the use of tousled curls or a classic white dress. The Instagram feed of @missomalondon is curated by Marisa Hordern who is Creative Director of Missoma Jewellery. As such, the feed has a very personal feel. It’s like your best friend went on vacation and took candid pictures of her jaw-dropping jewelry, then threw in a couple of shots of models here and there. You’ll love the vibrant colors of the photographs which represent the vibrant nature of the jewelry. 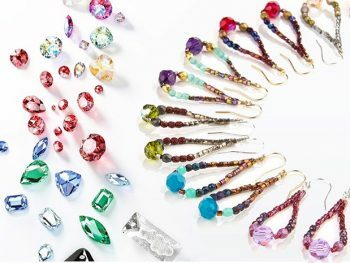 It is refreshing to have some color and gemstones in what sometimes is a very silver and gold dominant trend.